Nadine Tolman takes a sip of water from a plastic cup that her husband, Fay, has just brought her from the refreshment station. The gentle gesture from her husband disrupts Nadine, 74, who is lost in memories of exotic places the couple has explored over their lifetime together. She is pondering where they should go next, but turns her focus back to Fay, seated beside her in the waiting room of Clinic 3 at Duke Cancer Center on this cold February day in 2018. She’s a long way from her childhood home of Toronto, where she still volunteers annually at the Toronto International Film Festival. A long way from the Bahamas where she and Fay first met in 1968. A long way from Vietnam, where the couple took a Mekong River Delta tour in 2010. And a very long way from New Zealand where the couple spent what was supposed to be their dream vacation in December 2014. It was there, Nadine recalls, that she first noticed “some fairly large lumps” behind her ear. When the couple returned home to Cary, North Carolina, there were also lumps in her lymph nodes. 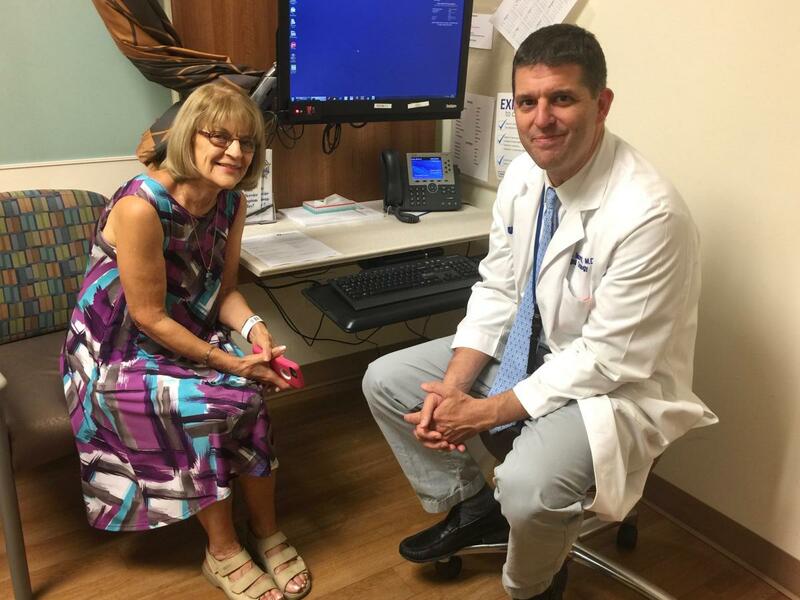 After a visit to Duke Cancer Institute hematologist oncologist Carlos Decastro, MD, Nadine was diagnosed with chronic lymphocytic leukemia (CLL). A staging CT scan for CLL also surprisingly revealed a suspicious abdominal mass, concerning for soft tissue sarcoma. As it turned out she had two. When in May 2015 surgical oncologist Dan Blazer III, MD, went to remove the 14 cm mass, he also discovered a smaller, 8.5 cm tumor hidden nearby. Blazer said Nadine’s experience “not noticing” she had a large sarcoma growing in her abdomen is pretty common. Nadine’s tumors, located near the left kidney, were identified as a retroperitoneal liposarcomas, an extremely rare cancer that arises from fat cells in the soft tissue of the retroperitoneum — an area located behind the abdominal lining. The larger tumor was considered well differentiated (low-grade), but showed some de-differentiated (high-grade) disease (a component of a more aggressive sarcoma) in a 1.5 cm area of the mass. The smaller tumor was completely low grade. “Nadine’s tumor size, multi-focality (more than one tumor), and evidence of higher-grade disease all put her sarcoma at high risk for recurrence,” said Blazer, noting the average recurrence rate with this disease is between 50 and 70 percent. The American Cancer Society estimates that about 13,000 new soft tissue sarcomas will be diagnosed this year in adults and children. Of those, only about 15 percent are abdominal/retroperitoneal in location. According to the National Cancer Institute, the relative five-year survival rate for this cancer is around 40 to 60 percent. Medical oncologists, radiation oncologists, and surgeons who work with this patient population at Duke aim to improve these numbers. She recounts how her scans were clean for two-and-a-half years after the initial resection, until three new tumors appeared around the same spot in October 2017. Since one of her previous sarcomas had shown some evidence of high-grade disease, five weeks of pre-operative radiation therapy was administered prior to consideration of re-resection. Director of DCI’s Radiation Oncology and Imaging Research Program David Kirsch, MD, PhD, explained that while no randomized trials have been reported testing the efficacy of radiation therapy for retroperitoneal sarcomas, Duke patients with high-grade retroperitoneal sarcomas are often treated with radiation therapy before surgery. He said that data from several studies, showing that radiation delivered to soft tissue sarcomasof the extremity (arms and legs) lowers the chance of localized recurrence or metastasis to a distant site, has been extrapolated and applied to patients with soft tissue sarcomas in other areas. “When you have something that’s very rare, like retroperitoneal liposarcoma, you have to use your best clinical judgement to decide what treatment has the potential to help each patient the most,” Kirsch said. Blazer said he’s optimistic because the three tumors he resected in October 2017, following radiotherapy, turned out to be low-grade, less aggressive tumors, and that February’s scans were clear, though he said there’s still at very high risk of recurrence given Nadine’s history. He tells her as much. … It’s May 30, 2018, and Nadine and Fay are in the exam room for her next three-month follow up. It’s their 48th wedding anniversary, and there’s much to celebrate. Blazer has good news for them. Now seven months since that October surgery, her scans remain clear. And her chronic lymphocytic leukemia remains “under control.” Nadine and Fay are elated. Since being diagnosed more than three years ago, she and Fay have toured the historic underbelly of Charleston with their two shelties, visited Italy and France, and road-tripped to Marco Island in Florida. 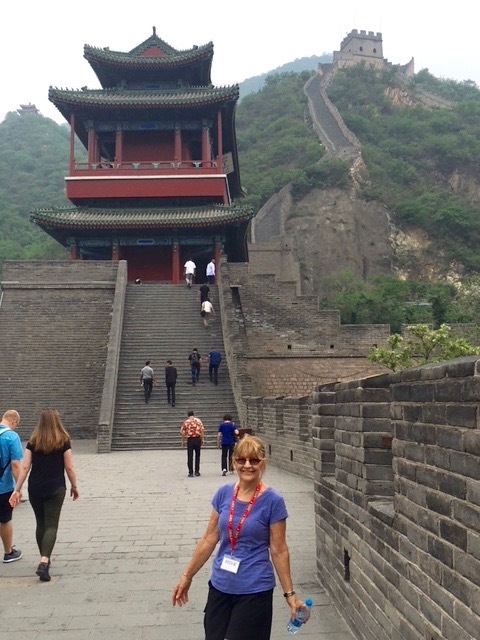 And they have just returned from an “exhilarating” trip to China where they hiked two hours to a distant sentry post of the Great Wall. When they’re not traveling, she says, the retirees play tennis and walk a mile or two every day with their dogs. Make A Difference: The Duke Multidisciplinary Sarcoma Research Program will host its annual Strike Out for Sarcoma 5K and Family Fun Walk on Sunday, Sept. 9, to raise funds for sarcoma research at Duke. For more information or to register, please go to Strike Out for Sarcoma 5K and Family Fun Walk. Duke is currently screening patients for a multi-site Phase I clinical trial (9 sites, including Duke) led by Massachusetts General Hospital — Proton or Photon RT for Retroperitoneal Sarcomas (NCT 01659203). In this trial, a standard dose of radiation is given pre-operatively to the majority of the tumor, while a simultaneously integrated boost of additional radiation (a higher radiation dose) is given to certain areas of the tumor identified as higher risk — the area where the tumor interfaces with the abdominal wall, where the surgeon and radiation oncologist think the tumor might recur.